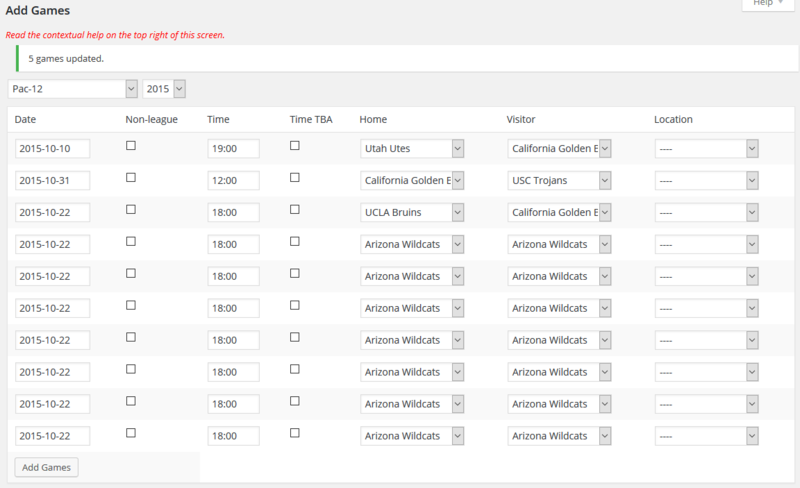 The Add Games screen allows you to add games in bulk to a given league and season. First, select the league and season, then enter the games. The process is fast and straightforward. The most important thing to know about using the screen is that when the plugin finds a row with the same Home and Visitor teams, it stops processing rows. So make sure the Home and Visitor teams match on the row after your last game entry. See the NOTES below the screenshot. Non-league games. Check this box for non-league games. The Home and Visitor drop-down menus, which normally display only the teams in the specified league, will display all the teams in the database. Time TBA. Check this box to show “To Be Announced” (“TBA”) in place of the game time. In this case the entry for the game time will never be seen, don’t worry about it. The abbreviation for “To Be Announced” may be set on the Setting screen. Location. Use this field for neutral site games, or if you haven’t entered a venue for the Home team. There is no need to use this field if the game is at the Home team’s venue.